Monday morning and I was up and loading the gear into Mum's van ready for the trip to Sandhurst, a stop off at Tesco’s for supplies and the tackle shop for bait (Mum's treat) and it was off to Sandhurst to meet Ethan. He gave me a quick text letting me know the gate code and I can presume I arrived at the lake a short while after him. 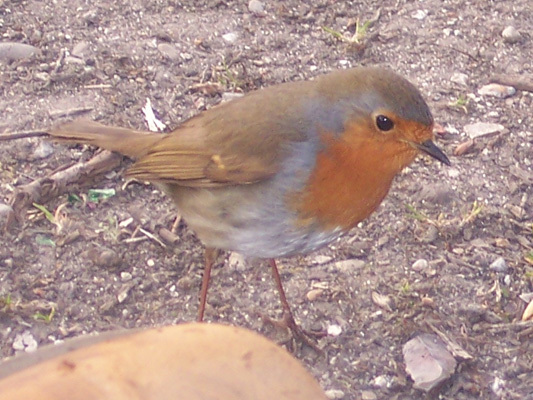 I gave him a bell letting him know I was here and he soon came round to load his barrow. "I've got us the island swims" he says. Brilliant, a couple of swims with known form. We wheeled the barrows around to the swims and settled which swims we wanted; it turned out to be pretty easy as we both wanted different swims. I opted for the right hand swim due to Stu's recent captures in there. And obviously Ethan choosing the left. We were in no rush to get fishing and we still had an hour before we could legally start, I took my time setting up my bivvy much to Ethan's amusement, but when it came to getting bank sticks level, very much like a tackle tart Ethan got his ruler out, and made a mess of it all (mine went in straight first time). We both tackled our rods up more or less the same, I opted to fish 18mm boilies on standard KD rigs on two rods and the other rod on a simple blowback rig. Ethan's advice was that the swims had been occupied all weekend and we should rest them for the rest of the day until the light starts to fade, I had no problem with this and it seemed a perfectly logical reason. We had a walk round the lake, a couple of brews back at the bivvy and a bit of a talk about rigs, and obviously a good laugh about the rig I'd found in a tree (it was shocking). 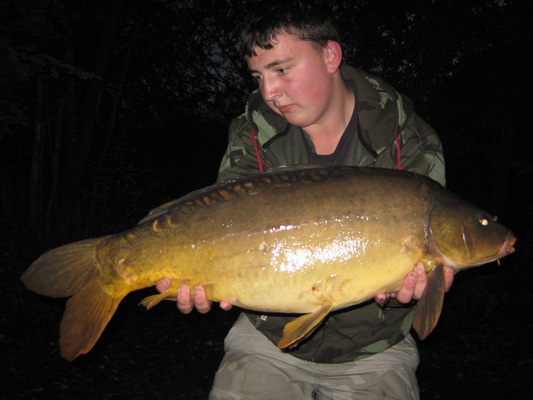 Come darkness and we both put a bit of bait out with the throwing sticks, both fishing beds of 18mm boilies. The seagulls picking Ethan's baits over mine making my life much easier. 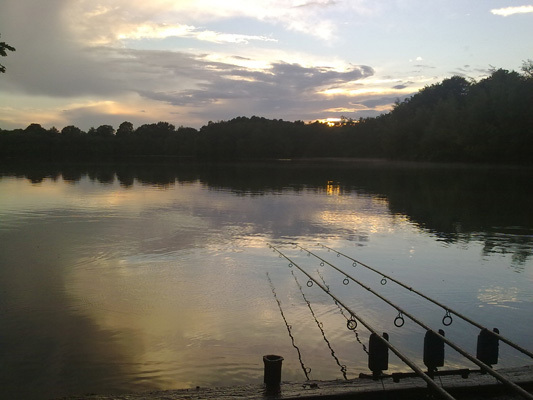 The rods were out before it went completely dark and we were both happy with our fishing, I put two rods out in some soft stuff at around 60-65 yards and dropped the third one about 15 yards out where a fished had rolled previous. We were both receiving liners and were both feeling confident. Ethan, forgetting his pans and bowls borrowed mine after I had had my dinner and we chilled in his bivvy for a while. Then the heavens opened and the rain drenched everything, including us, we decided to opt for my much sturdier bivvy to sit under for a while and I decided to make a brew. This only lead to disaster as I caught the tip of my finger on the extremely hot kettle which led to a very loud shout and me sat with my hand in a bucket of water for most of the night. (Ethan thought this was hilarious) Damn devil kettle!!! 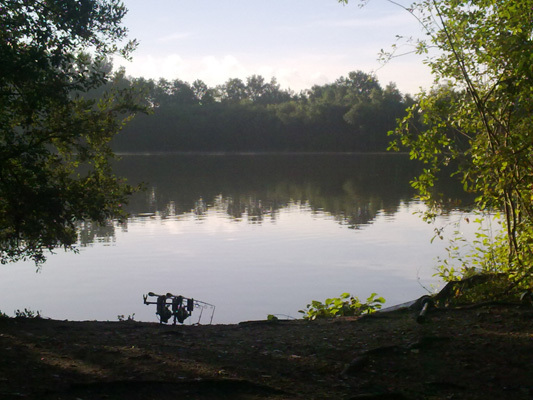 It came to around 2 ish and we both decided to get our heads down, carp were still crashing over the lake and we were surprised that none of us had had a take when we woke at 5. Breakfast cooked and again it was Ethan's idea to remove the rods from the water at around mid-day ish. 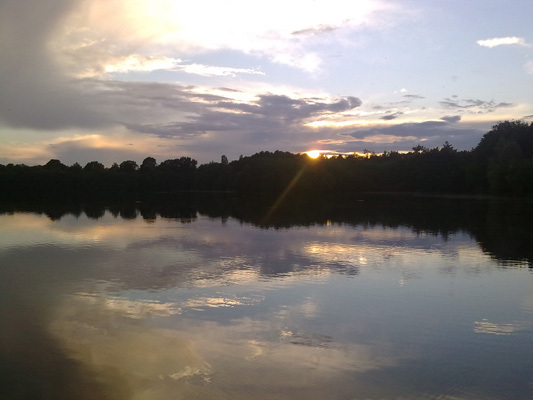 We went for another walk around the lake and it seemed not many anglers were catching. It came to around 4 in the afternoon and I went for a walk to one of the loos, on my way round the lake it seemed a couple of fish came out and as I continued around the lake Ethan's mate in the second pipes was holding a rather nice 29lb mirror carp while Ethan snapped away with the camera. After seeing this we both decided to get back to our swims and get the rods out. The rain seemed to come in bursts throughout that day but this evening looked like it would be a dry one, we scattered more baits out with the sticks and started getting the rods out, I had removed one of my kd rigs from the heli leader and opted to tie on a mini chod rig, this was fished with a 16mm cell pop up. This was the last rod to go on its spot and as I was setting the bobbin I noticed the alarm wasn't picking up anything. Ethan and I tried everything to get the alarm working again but it was just not happening, I decided to leave the rod out and take my chances on hearing the clutch ticking. As we cooked dinner again Ethan was telling me how much I deserved a fish, he also said that he reckons it will come on the rod with the broken alarm. As he finished cooking his dinner and started to plate it up hey presto the rod on the broken alarm was away, get in! The fight was a prolonged one due to the fact the fish managed to wipe out my other rods, but after much ribbing from Ethan and his mate it was finally in the net. BACK OF THE LANDING NET!!! I handlined the other two rods in and cut them off, I managed to retrieve all three of my rigs and the backleads; I cut the mass of line off and threw it in the bin, leaving just the rig in the mouth. We got the fish on the mat and the hookhold was a solid one requiring forceps to remove the hook, on the scales she went 18lb bang on. A few photos and a couple of returning shots and back she went, congratulations from Ethan and my first fish of 2010 resulted in a very happy me. Back to dinner and a couple of drinks to celebrate and we decided to call it an early night at around midnight. Little did I know the night was going to bring more for me? 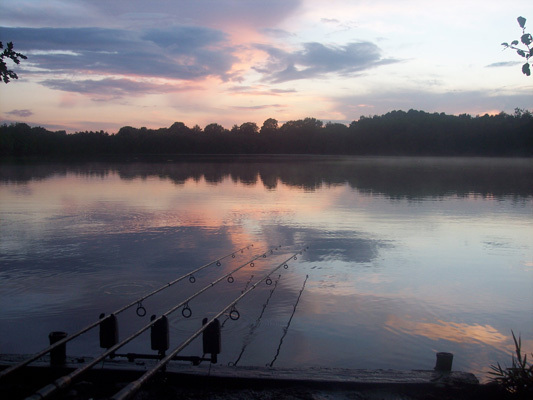 I woke in my bag disturbed by something, which is a little unlike me, I looked over to the rods and the middle rod had been pulled way forward and the reel was by the buzzer, the clutch was going into meltdown. I lifted into the fish and its first run told me it may be a slightly better one, who knows. I shouted to Ethan but he was away with the fairies, a short fight later and the fish was in the net, a much bigger looking common. I made sure the net was secure and went round to wake Ethan, this proved to be the hardest task of the weekend as even shaking him about like a rag doll and pulling line of his reels through the alarms wouldn't wake him. 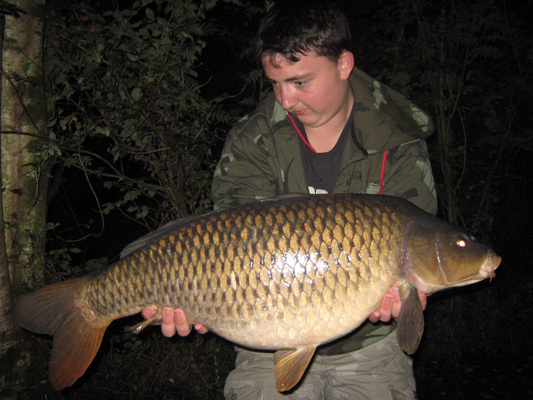 He eventually came round and he helped with the weighing and photographs, as we lifted the scales they set on 23lb 9oz. A new Pb for me and my second fish of 2010!!! What a result, and I was over the moon, words could not describe how good I was feeling after these fish, a whole year of blanking and finally I'm back in it with a new burst of confidence, once again Ethan took some photos and soon after I was recasting the rod and going back to sleep. I awoke a bit later than usual and thought it looked a bit cold, I’ll have another hour in the bag, why not, I deserve it were my exact thoughts. The bobbins had remained still for the rest of the night and back to sleep it was. When I woke again the rest of the morning was filled with breakfast and leaving the rods out as long as possible as I had to finish fishing at 11. After a reasonably slow tackle down I brought the last rod in and loaded the barrow. 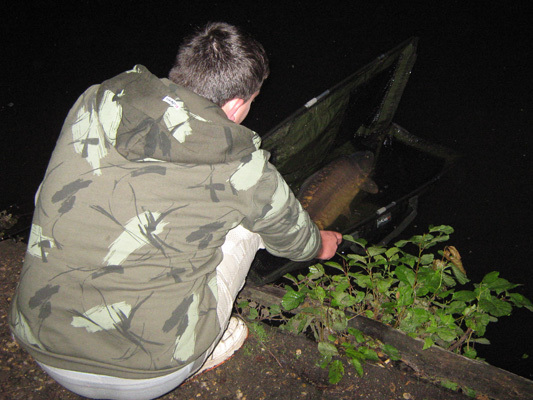 Parking it by the bridge and sitting in Ethan's swim and having a good chat about all things carpy and non-carpy. I left Ethan on the Wednesday at about one o'clock. I wished him the best of luck for his further two nights. All in all it was a fantastic session and upon reflection I am grinning at the captures. Hopefully I’ll be back in October.